Year 6 are half way through! Well done to our Year 6 pupils, who have now completed 2 out of the 4 days of their SATs tests. The English tests are complete, and it's maths today and tomorrow. 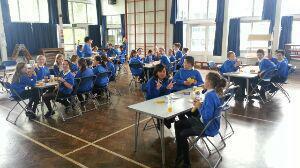 Here they are enjoying a spot of breakfast before school Keep it up!